At Roadway Construction Service (RCS), ‘people protection’ is a major component of our traffic control services. This protection covers not only work crews and drivers, but pedestrians as well. Accordingly, we channel a large portion of our skills, experience, and resources into pedestrian safety. Thankfully, the efforts have paid off handsomely with an outstanding pedestrian safety record acclaimed throughout the industry. Of course, pedestrian safety isn’t in our hands alone – everyone in California must play a role to ensure success. Which is why we appreciate Caltrans’ recent effort to protect pedestrians statewide. On October 27, Caltrans unveiled its new California State Bicycle and Pedestrian Plan (CSBPP) – the first of its kind. The ultimate objective of the CSBPP is to improve safety and access for those traveling the California streets, especially bicyclists and pedestrians. The ambitious plan takes into account the growing popularity of alternative transportation methods, such as bicycling and foot-travel. With more and more people realizing the health and environmental benefits of these alternatives, bicycle and pedestrian traffic will inevitably increase. In response, the plan makes bicycle and foot travel bigger players in California’s overall transportation system. The CSBPP is by no means a one-way street. As with all pedestrian safety measures, everyone must get involved to make it work. Caltrans therefore is seeking the widespread support and participation of the general public. To maximize participation, the organization will be conducting a number of targeted outreach activities statewide. Once completed (sometime in 2016), CSBPP will serve as a model for other alternate transportation strategies. Among these is the existing Active Transportation Program (ATP). This program provides funding for projects designed to reduce the number of road vehicles, implement various environmental improvements, and foster sustainable communities. 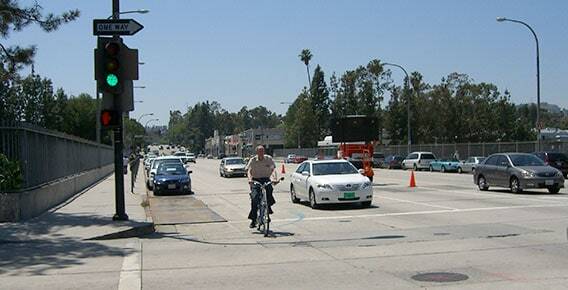 Once again, our hats are off to Caltrans for this visionary plan to improve pedestrian safety. Naturally, RCS will continue to do its own part to protect travelers and workers on all the California roads with safe, high quality traffic management services. If you’re interested in learning more, contact RCS for a complimentary consultation. You’ll discover why we set the standard for safety in all areas of traffic control in Los Angeles, Orange County, and all of Southern California. To find out more about the California State Bike & Ped Plan click here.